Harbortouch Retail is a POS system designed specifically for retail environments. No matter what kind of retail operation you own, whether it’s an apparel shop, convenience store, liquor store, Mom and Pop, specialty store or any other retail location – we have all the retail POS features you need at an unbeatable price! The Best Retail POS System For Your Business – No Upfront Cost! Your search is over! 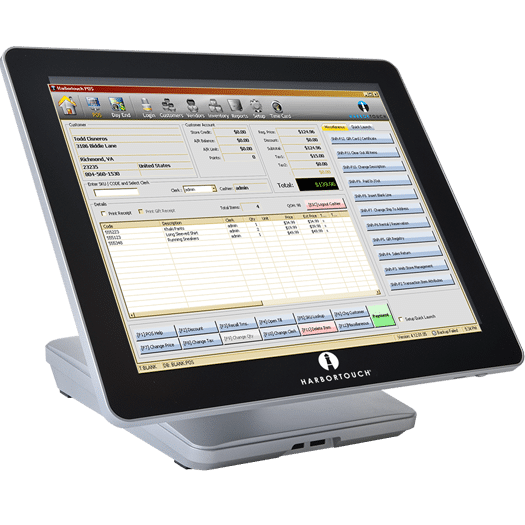 Streamline your operations with our best-in-class retail POS software and hardware for large retail businesses. Get powerful features that will save you time and money, and help make you more profitable while running your business more smoothly. Any retail business that needs an easy-to-use and robust POS solution can sign up and get approved for our retailing system with ease. Enjoy an easy sign-up process with no up-front costs. 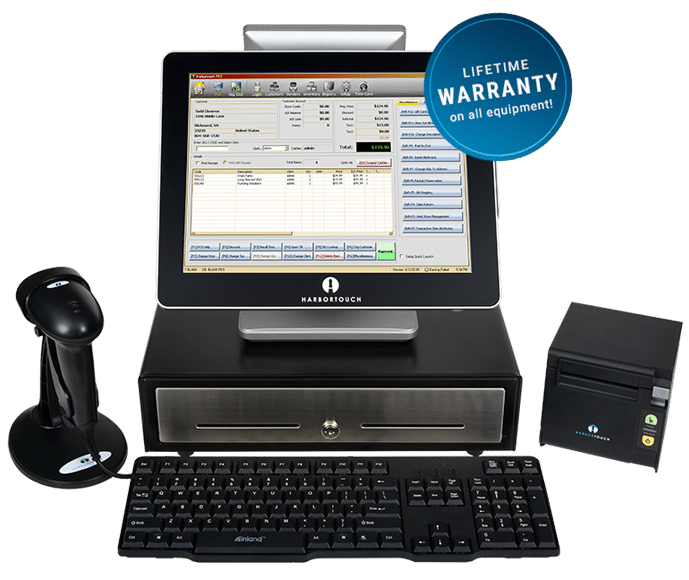 You’ll get the free point-of-sale equipment, free programming, free on-site installation, and a lifetime hardware warranty. And with one phone number to call for 24/7 service and support, we’ve just made life 1000% easier for you to replace your old cash register or to buy an entirely new touchscreen retail POS system for your small business today. Our advanced retail POS solution is designed for large retail organizations such as department stores, liquor stores, grocery stores, beer distributor, or any other business type that has over 10,000 SKUs. If you have a smaller retail location, then we recommend our new retail POS system – Harbortouch Checkout. Perfect for apparel and shoe stores. Configure an attribute matrix for different style types, colors or sizes for any specific piece of clothing or shoe. You can import your current inventory database fast and easy. Your system will track sales to monitor your current stock levels and create purchase orders automatically if products run low. Track your commissions and pay employees for selling certain products. Award commissions as a flat amount, percentage of product sale prices or a percentage of profit. Time clock features are built-in to manage employee hours worked and productivity. You can adjust security option levels to control specific features that employees are authorized to use. For special occasions like a baby shower, wedding party, or graduation, customers can create a registry list they would like to receive as gifts and the list is updated as items are purchased. Perfect for loyalty and incentive programs, with the customer database, you can keep a record of purchasing history so you can identify your best customers and sales trends. Keep contact information as well. Reserve an item defined for layaway allows customers to purchase the item at a later time. Payments can be made on the purchased item until it has been completely paid in full. Inventory stock levels are adjusted accordingly based on the purchase status. Easily create purchase orders directly in the point of sale system to replenish stock and for managing inventory. Support for renting items for any product type imaginable. Keep track of the rental within the customer database with information relating to the rented item. Manage your important vendor relationships and organize your suppliers and business contacts in the vendor management database. 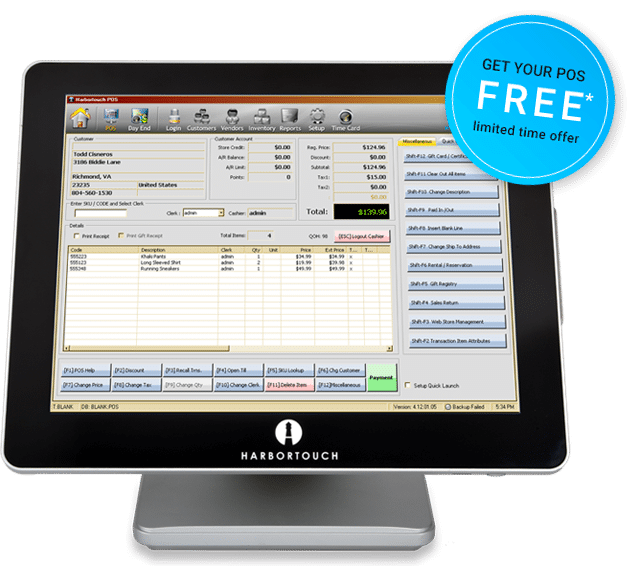 Harbortouch Retail POS includes gift receipts so customers can purchase presents with easy exchange and returns with no pricing displayed on the ticket. Customize your product pricing dynamically to accommodate product sales, coupons, and any other type of discounts. Resell products on consignment and track the amount of money that you need to pay. Our retailing system has advanced reporting features so you can take full control of your company.